Have NFPA® Codes and Standards In Hand Anytime You Need Them. 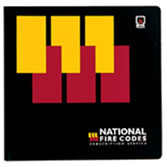 Subscribe to the National Fire Codes® Subscription Service for 300+ codes and standards in print. Stay up-to-date with changing NFPA codes -- and feel confident that you are making the best on-the-job decisions to minimize risk and maximize safety. With NFPA codes and standards continuously being updated, it's essential that you stay up-to-code to help prevent errors and costly rework. One of the most effective ways to do this is through the National Fire Codes Subscription Service -- NFCSS. You'll also have the latest NFPA 70®, National Electrical Code® (NEC®), NFPA 25, NFPA 54, NFPA 58 -- plus every other NFPA code and standard. Feel confident that you are working with the most up-to-date codes. Subscribe to NFCSS today!